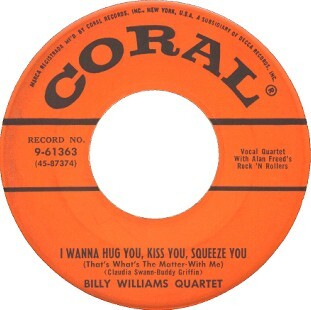 "I Wanna Hug You, Kiss You, Squeeze You"
Above: Photo of The Billy Williams Quartet. Members were Billy Williams (lead tenor), John Bell (tenor), Claude Riddick (baritone), and Eugene Dixon (bass). 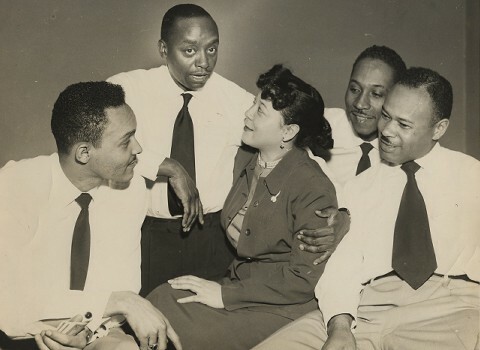 In above photo, Williams is second from left with his arm around Conchita Nikkitani, entertainment writer for the Pittsburg Courier Press. For a short article about The Billy Williams Quartet by J.C. Marion, please click HERE. 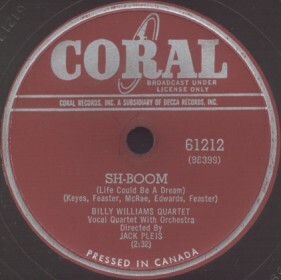 Above: Label image for Coral 61363 recorded 1/25/55 and released in February 1955. This is one of my favorite rockers. It features an introduction by dj Alan Freed (who was hitting it big in NYC at this time), Big Al Sears' saxophone, Mickey Baker's guitar, and Panama Francis' drums. Label states "With Alan Freed's Rock 'N Rollers". Click on an option below to listen to "I Wanna Hug You, Kiss You, Squeeze You" by The Billy Williams Quartet using RealPlayer. Above: (Left) Label image for MGM 11172 released in February 1952; (Right) Label image for Coral 61212 released in July 1954. 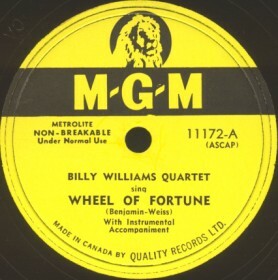 The Billy Williams Quartet had releases on MGM (1950-52), Mercury (1952-54), and Coral (1954-58). A) Click on an option below to listen to The Billy Williams Quartet using Streaming RealAudio.